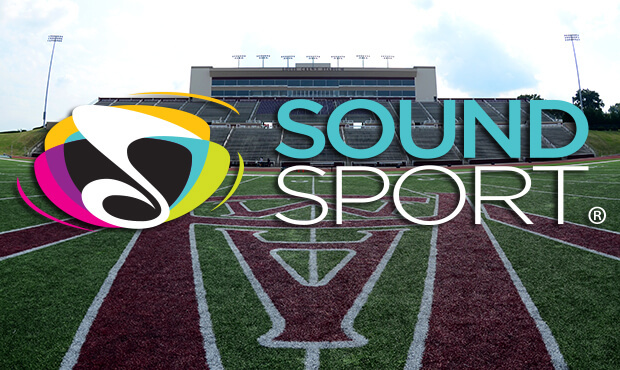 SoundSport events will kick off at Alabama A&M on Friday, July 25. Drum Corps International's new SoundSport division will host its first competitive events of 2014 this weekend, with two exciting lineups of teams scheduled to perform as the opening acts of DCI Tour events in Huntsville and Atlanta. Scheduled to perform on Friday, July 25, in Huntsville, will be two great Alabama teams including the hometown Rocketeers along with the rejuvenated Southwind based in Mobile. They will be joined by the Columbian Medellin Gran Banda, a team that is making its way all the way from South America to participate in this summer's SoundSport events. The University of North Georgia's SoundSport team will also join the lineup of groups performing in Atlanta on Saturday, July 26. Making their debut in 2013, SoundSport events showcase ensembles of any instrumentation and any skill level, creating local, low-cost and entertaining performance opportunities for participants. Teams of five or more members of any age will perform shows that are five to seven minutes in length on a "stage" that is 20 yards deep and 30 yards wide. "The teams performing this weekend are a great example of exactly the types of groups SoundSport is designed to spotlight," said DCI's director of business development John DeNovi, who helped get SoundSport off the ground last year. "You have a team like the Rocketeers who is made up of many drum corps alums joining together to perform in their local community; And then you have a team like Southwind that is a reemerging drum corps after last competing on the DCI Tour in 2007." Both SoundSport events this weekend will take place just after gates open at the stadium, and will be the opening act to the drum corps show later that afternoon/evening. The events will take place on the football field of the stadium and admission is free with a ticket to the drum corps show. DCI North Alabama - Huntsville Presented by U.S. Army Music Program Friday, July 25 | A&M's Louis Crews Stadium 5:00 p.m. Gates Open 5:15 p.m. Medellin Gran Banda – Medellin, Colombia 5:25 p.m. Rocketeers – Huntsville, AL 5:35 p.m. Southwind – Mobile, AL 6:30 p.m. First drum corps steps off Judges: Music Performance: Albert Lo, Denton, TX Visual Performance: Bruce Jones, Fleming Island, FL Overall Impression: Glen Fugett, Arlington, TX Buy tickets to this event. DCI Southeastern Championship - Atlanta Saturday, July 26 | The Georgia Dome 11:00 a.m. Gates Opens 11:15 a.m. Rocketeers – Huntsville, AL 11:25 a.m. Southwind – Mobile, AL 11:35 a.m. University of North Georgia- Dahlonega, GA 11:45 a.m. Medellin Gran Banda- Medellin, Colombia 2:30 p.m. First drum corps steps off Judges: Music Performance: Garland Markham, Dallas, GA Visual Performance: Mike Anderson, Boise, ID Overall Impression: Michael Turner, San Francisco, CA Buy tickets to this event. While SoundSport events are adjudicated, there are no numerical scores. Teams are evaluated by a team of three judges in the categories of Music, Visual and Overall impression. Execution is important, however, SoundSport judging places additional emphasis on showmanship and audience engagement. Teams will receive feedback on their performance with an overall rating given at the end of the event. "SoundSport is all about achieving the best combination of excellence and fan enjoyment," DeNovi said. "We're really excited to see these teams on stage this weekend, unified in their goal to entertain and provide great experiences for their performers." Learn more about SoundSport.